Care2 Causes | Where Do Ships Go to Die? Where Do Ships Go to Die? NOTE: This is a guest post from Patrizia Heidegger, the Executive Director of the NGO Shipbreaking Platform. Consumers worldwide more and more demand transparency of the supply chain — to know where, when and how the goods they buy were produced, and who produced them. The growing demand to hold companies responsible in our globalized economy is now also reflected in international law since the international community has agreed that businesses have a legal obligation to respect human rights — not only inside their own premises, but in their whole sphere of influence. The maritime sector and shipping has largely remained unshaken by these changes. We have witnessed important developments with regards to the mitigation of maritime pollution (such as oil spills) and harmful emissions (especially in coastal areas). But, have you ever wondered what happens to a ship at the end of its life? Where do ships go to die when they get too old to sail across the oceans or just aren’t profitable enough? If you bought a car recently, gone to IKEA to purchase a new shelf or a sofa, or strolled in your favorite shopping mall to find clothes at a bargain price, you have probably been in touch with the shipping world without realizing it. The vast majority of what you can buy in shopping malls and supermarkets has been shipped there. Shipping remains the cheapest way to carry goods around the world. Thousands of ships of all kinds and sizes roam the seas at all times: passenger ships such as cruise ships and ferries, oil and gas tankers, container ships, dry cargo ships, etc. According to UNCTAD, 80% of the world trade is carried by sea. The fact that goods can flow easily and cheaply around the world on ships is one of the main driving factors behind the globalized economy. When boats reach the end of their service lives, the vast majority of them are sold for breaking to yards located on the tidal beaches of South Asia, where ship owners are ensured the maximum profit margin through the sale of their ships. Whereas European-based ship recyclers can offer ship owners between 150 and 225 EUR per ton of steel, South Asian shipbreakers can offer up to 450 EUR per ton — a profit shipowners are reluctant to give away. Like other economic sectors, shipping was hit by the financial crisis. Private and institutional investors are willing to invest in brand new eco-ships, which pushes older ships towards the exit door. The high number of ships ordered before the financial crash means that many ships are laid up in ports; there is currently an overabundance of ships worldwide. 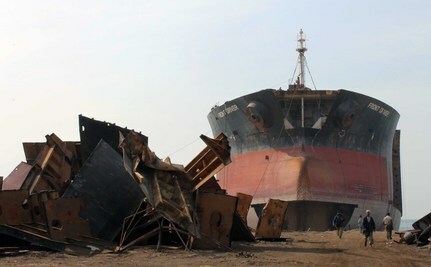 More and more ships are sold for dismantling and, therefore, end up on the scrap heaps of South Asia. India, Bangladesh and Pakistan: together, these three beaching destinations represent 70% of the shipbreaking capacity worldwide. Every day, scores of unskilled and unprotected workers are deployed by the thousands in the shanty towns of Alang and Mumbai (India), Chittagong (Bangladesh) and Gadani (Pakistan), away from the public’s eye (but not from Google Maps). In 2012, the NGO Shipbreaking Platform recorded that at least 365 end-of-life ships were beached in South Asia for breaking by European companies alone. That means that one ship was beached every day by companies that know about safer and cleaner alternatives. In search of the biggest profit, ship owners are selling their ships far away from the ports and waste treatment structures, far away from higher labor costs: very little mechanization, lack of training and restricted access to trade unions means costs are kept low and often far away from the authorities. Alang is the world’s biggest shipbreaking yard. It offers an ideal environment for quick profit making: ships are easily beached, migrant workers provide cheap labor, trade unions have a difficult time organizing workers, and authorities turn a blind eye to the situation as the government collects scrap steel import duties from the beached ships. As a result of the lack of facilities and isolation from oversight, corruption and harmful working conditions are rampant in the yards. 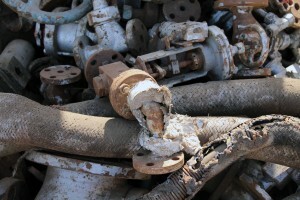 There is a clear lack of interest from the owners of the shipbreaking yards, who also earn their good share of profit. In Bangladesh, hazardous forms of child labor are still a reality. Last year, a 16-year-old boy working the night shift on the yard — the most dangerous shift — was crushed to death under the weight of a steel plate that was tipped over by a gust of wind. Shipbreaking workers, untrained and unsupported, are mostly unaware of the toxic materials that are leaked from the ships when they cut them into pieces manually and without protection. Until recently, ships were built with asbestos, a fiber extracted through mining which has proven to be extremely harmful to human health and which can cause deadly diseases such as mesothelioma and lung cancer. Asbestos is now banned from shipbuilding, but it is still found onboard most ships. When a ship is cut down so the steel can be retrieved to be recycled in steel plates and sold on the local market, asbestos is freed from the structure of the ship. Pipes, fireproof doors, gas caskets, and anything else meant to insulate likely contains asbestos. Along with asbestos, ships contain a myriad of other toxic materials, including PCBs in paint chips, mercury in thermometers, radioactive materials in fire detectors, and organic waste, sludge and oil in the engines. Governments worldwide are looking for solutions to mitigate the adverse impacts of shipbreaking on the environment and workers with little success so far. The European Union has recently come up with a new regulation, which should eventually become a law in 2014, but its scope is very limited. It only covers ships that fly a European flag at the end of their lives. Only a tiny 8% of the worldwide merchant fleet fly a European flag for the last voyage. Had the EU favored ships owned by European companies instead, this figure would have risen to 40%. The NGO Shipbreaking Platform remains skeptical that the EU regulation will bring long-lasting change to the current issues. Through our OFF THE BEACH! campaign, we aim to raise public awareness of the human rights abuses and pollution caused by shipbreaking practices in South Asia, promote marketplace incentives to divert traffic away from the infamous breaking beaches and demand investment in proper structures. We have launched a Care2 petition, to which you can add your name. We need to ask governments to come up with long-term solutions and enforce existing legislation regulating international waste trade. We need to hold the shipping industry accountable. With your help, let’s move shipbreaking off the beach, protect workers’ safety and the environment and make ship recycling clean and safe. The Shipbreaking Platform is a global coalition of environmental, human rights and labor rights organizations including in the largest shipbreaking countries, India, Bangladesh and Pakistan. Our overarching goal is to prevent toxic end-of-life ships from being beached in developing countries. The ocean is huge & sinking for reef well & good but will also start bcoming a problem. Recycled for steel well & good as it provides work,however, this informal sector needs to be overhauled & regularized so that there is no exploitation. Why not recycle instead of sending them off to a watery grave?